Online application system is better then Manual System. Below follow Instruction. b. Visit: http://joinnavy.mil.bd/ Click '[Apply Online ##edit##]' or http://joinnavy.mil.bd/candidates/apply. d. Personal Information, Present Address, Permanent Address, Parent's Information, Guardian's Particulars (If not Father/Husband), Portfolio (image) all information full up carefully. e. Click Next and full up your 'Academic Information'. 1. Preliminary Medical Test test and Interview. After payment complete Every applicant can download Admit Card login with User Id and Password at http://joinnavy.mil.bd/. Bangladesh Navy Recruitment authority will send you Admit Card, Exam Center and Location. Also you can visit update news at notice board http://joinnavy.mil.bd/. 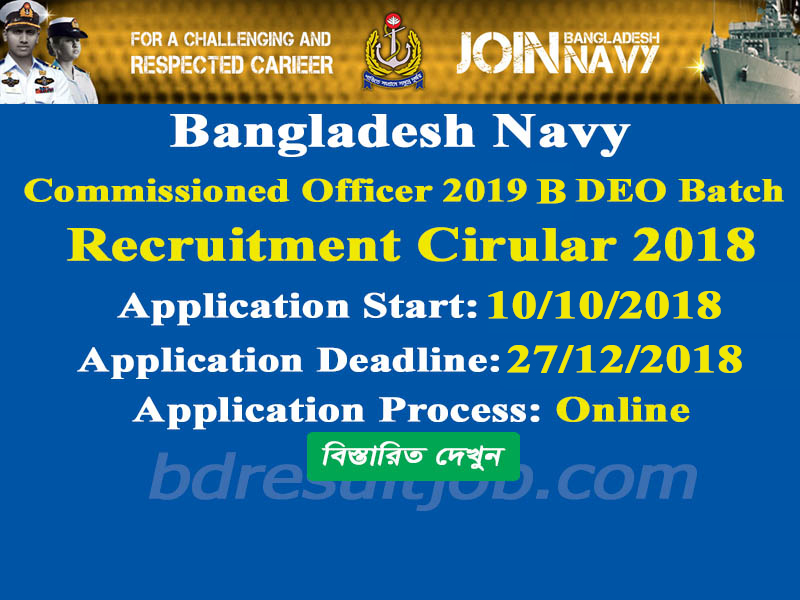 Bangladesh Navy Recruitment Authority will published Their notice board. Also you can visit update news at notice board http://joinnavy.mil.bd/ . 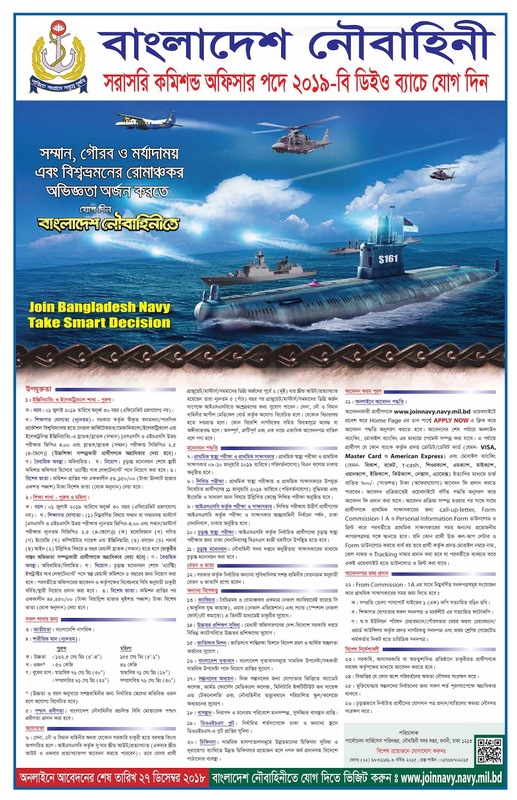 Tags: join bangladesh navy, www.joinnavy.mil.bd, www joinnavy mil bd Apply Online, navy job circular, Bangladesh Navy Officer Cadet Apply Online, Bangladesh Navy Commission Officer 2019 DEO B, Bangladesh Navy Officer Apply Online 2019 DEO batch, jobs, job search, online jobs, government jobs, jobs in bangladesh, bd jobs today, best job sites, Bangladesh Navy, Bangladesh Navy cadet Recruitment, job opportunities in bangladesh, bd govt job circular, bangladesh navy circular, join navy, nevy job, all government job circular, new government job circular, new job circular bd, join bangladesh army mil bd, bangladesh navy job circular 2018, bangladesh navy, govt circular bd. 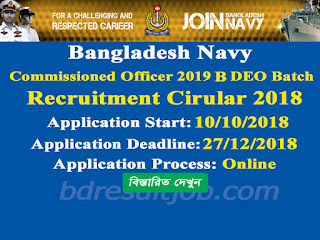 join bangladesh navy, www.joinnavy.mil.bd, www joinnavy mil bd Apply Online, navy job circular, Bangladesh Navy Officer Cadet Apply Online, Bangladesh Navy Commission Officer 2019 DEO B, Bangladesh Navy Officer Apply Online 2019 DEO batch, jobs, job search, online jobs, government jobs, jobs in bangladesh, bd jobs today, best job sites, Bangladesh Navy, Bangladesh Navy cadet Recruitment, job opportunities in bangladesh, bd govt job circular, bangladesh navy circular, join navy, nevy job, all government job circular, new government job circular, new job circular bd, join bangladesh army mil bd, bangladesh navy job circular 2018, bangladesh navy, govt circular bd.